ALEXA HARDING was born and raised in Hollidaysburg, Pennsylvania. The daughter of Noble and Shriners Hospitals for Children – Erie Board of Governors member Troy Harding and his Lady Sue, Lex began her Shriners Hospitals journey in 2012. Lex was diagnosed with a double scoliosis curve in her back. 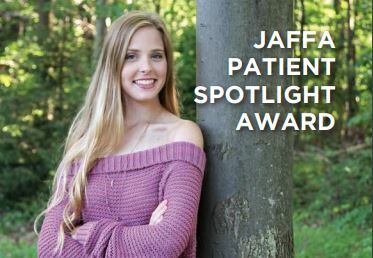 After being evaluated by the world-renowned doctors within our health care system, Lex went through nearly two dozen appointments at both our Erie and Philadelphia hospitals as well as two surgeries to fix her medical condition. During her recovery, she began speaking at a number of events about her surgical journey and the world-class care given to her by our hospitals. In 2017, looking to give back to the hospitals who gave so much to her, she organized a fundraiser by selling copies of a charcoal piece she created in her high school art class. She then presented a copy to our Erie Hospital as well as gave an inspirational speech behind the piece. She is a 2018 graduate of Hollidaysburg Area High School and currently attending Gannon University in Erie, Pennsylvania with a major in Respiratory Therapy with hopes of supporting our hospitals in another capacity, this time as a medical professional. She is also on Gannon’s competitive Dance Team and a member of the Honors Academic Program. Lex hopes to continue to share her story of being a Shriner’s patient with more people as well as bringing awareness to what Shriners mean to her and other patients.